Mononucleosis, also commonly referred to as mono, is an illness that shares many of the same symptoms as the flu. When you have mono, it may be several weeks or even months before you’re recovered. Getting a proper diagnosis and recommendations from a medical professional can help the healing process. A medical professional can also ensure you’re not experiencing any complications of mononucleosis, such as an enlarged spleen or liver problems. While mono is contagious, the virus that causes the infection doesn’t spread as easily as some might assume. In fact, the common cold is easier to catch from another person than mononucleosis. The virus that causes mono is spread through saliva. Kissing, sharing food or drinks, or even a sneeze or cough are all ways mono can be passed from person to person. The symptoms of mononucleosis can range from barely noticeable to severe. Recognizing the symptoms can help you determine when you should see a medical professional. According to WebMD, 3 out of 4 people who have mono will have an enlarged spleen, which is at risk of rupturing. Do not lift anything heavy and avoid any activity that could cause trauma to your abdominal region, such as contact sports. An enlarged spleen is likely to cause abdominal pain. 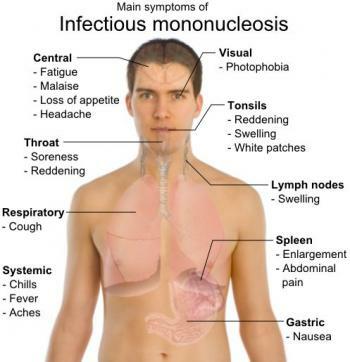 Unlike some other types of infections, mononucleosis is not treated with antibiotics. This is because mono is caused by a virus rather than a bacteria. The best medicine is generally plenty of rest and fluids. Medication to reduce a fever or soothe a sore throat may also be helpful. If you’re experiencing any of the symptoms of mononucleosis, it’s important to see a medical professional to get a proper diagnosis. It’s possible that you have a different type of infection that can be treated with antibiotics. The experienced medical professionals at your local FastMed Urgent Care will provide you with prompt, personal medical attention. All our clinics feature on-site labs to perform a mononucleosis spot test, so you’ll get your results fast. If your spot test shows the presence of heterophile antibodies, it’s a good indicator that you have mononucleosis, though in rare cases a false-positive result may be returned. Typically, if there are no heterophile antibodies, it is likely that you do not have mono. However, a negative test may be returned if the test was administered too soon (1-2 weeks after beginning of illness). In these cases, your healthcare professional may have to repeat the test. In very uncommon cases where a false-positive result is returned, the individual may have Hepatitis, Leukemia, Rubella, Systemic lupus erythematosus (SLE) or Toxoplasmosis. Stop by your neighborhood FastMed clinic today, and be sure to check out our Health Tips and Resources page to learn more about identifying and treating mononucleosis and other illnesses.